Towering over the labyrinthine streets and markets of Marrakech is the city's principal landmark, the minaret of the Koutoubia Mosque, known as the 'mosque of the booksellers' because of the bazaar of book traders that used to be nearby. The red stone mosque was first built in 1147, but demolished and rebuilt in 1199 because it was not correctly aligned with Mecca. The mosque has 17 aisles and 112 columns, and room for thousands to pray within. The ornately carved minbar (pulpit) is believed to have been a gift from the Almoravid Sultan Ali Ben Youssef. 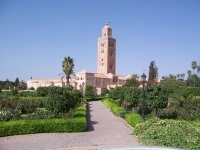 The minaret is 221ft (69m) high and consists of six chambers one atop the other, ascended by a ramp through which the muezzin rises to the top balcony. The mosque, as a sacred place of worship, is unfortunately closed to non-Muslims, but the gardens and the general area around it is a wonderful place for an evening stroll. The minaret is perhaps at its most beautiful when lit up at night, but is best for photographs at sunset, when the red stone glows. Hearing the call to prayer of this ancient mosque is a particularly special experience.